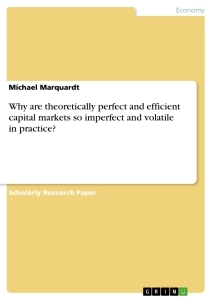 Why are theoretically perfect and efficient capital markets so imperfect and volatile in practice? The Efficient market hypothesis can be considered as part of rational economics but it does not specify at all how individuals should or will act. Therefore it might be a useful model of the functioning of the market as a whole but it does not explain the behaviors of investors as well as managers and other participants. While the Efficient market hypothesis deals as a basis for understanding the normal working of the markets, from time to time it might happen that the market as a whole or an individual stock may act irrationally. Such behavior is well known and generally occurs when the market price of a share turns away from its intrinsic value. The result is what commonly is called a bubble. This term is often used but the reasons for the occurrence are quite unclear. In fact, at the same time as the market as a whole has become more efficient, instances of irrationality have become more common or at least appear to be. Therefore we try to discuss the question why capital markets, which are considered as efficient and perfect in theory, are volatile and imperfect in reality. The paper responds to this question by discussing mainly the irrational behavior of people by turning into the field of psychology. Furthermore it seeks for approaches of explanation conducted by different investment strategies containing among others an increased use of derivative instruments or single trades based on massive capacity which therefore influence prices. In general the paper can be divided in 3 parts, a theoretical as well as an analytical one and a final point the Conclusion (Part C) which sums up the basic findings of the paper. Whereas Part A can be regarded as delivering the theoretical background, Part B contains the empirical analysis based on several case studies. Chapter 1, 2 and 3 are providing the reader with the needed knowledge of the capital market, volatility and the efficient market hypothesis in order to assure the understanding of the more complex prosecution of the paper After discussing those fundamentals the paper soon takes a view on some instances of irrationality in Part B, but first of all delivers in Chapter 4, 5 and 6 some theories that attempt to explain such irrationalities. The financial market is a market where funds are been transferred from those who have excess to those who need funds1. This is simply to ensure that preferences of the different participants in the market are satisfied through trading (that is buying and selling). Participants in this market have different views as some may want to invest in short term funds and others in long term funds as well as some are high risk takers and others try to avoid risk and some of them would prefer to obtain funds by borrowing and others by issuing stocks. On such bases, it is very important for a new investor to gain a good knowledge of the different kinds of financial markets to allow effective trading and in this paper we basically focus on the capital markets. The Capital Market is a financial market where long-term funds are traded, that means financial instruments with a maturity of more than one year2. It is in the capital markets where huge amounts of trading occurs and the most common capital market securities are bonds, mortgages and stocks and the market for derivatives of financial instruments3. The major participants involved in this market are investors and they are classified as individual and institutional investors. The individual investors have their small investments in large corporations making them partial owners of the corporation and their ownership in the corporation is scatted amongst the other numerous shareholders, which to an extent affects their influence on the management of the corporation. On the other side, the institutional investors include financial institutions such as pension funds, insurance companies and mutual funds. These institutions hold huge positions in corporations and as a result they have high potentials in influencing management decision of the company4. Moreover, due to the large sales and purchase of stocks by such institutional investors, they significantly affect the market price of securities. For the reason that they have more resources than the individual investors, they are able to monitor and ensure frequently that managers serve at best to maximise shareholders value as they have several shares in firms. With the major participants involved, trading in this market is sub-divided into the Primary and Secondary Markets. In the primary markets suppliers of funds transfer their excess funds directly to the users of funds through the purchase of securities that is new securities are traded for the first time. Companies, government, or public sector units first sell securities in this market for the first time through Initial public offerings (IPOs), private placements (mostly qualified investors), rights issue (for already existing companies), and or auctions5.The most common purchasers of newly issued stocks in this market are the institutional investors. The process of issuing new securities to investors is done through the help of intermediaries known as the underwriters. On the other hand, in the secondary market, securities traded are securities which have already been offered to the public in a primary market and are listed in an exchange, for example the NYSE or the Deutsche Boerse. Such securities that can be traded in the secondary markets include equity shares, bonds, etc. However, the fact remains that most of the trading actually occurs in secondary markets as they play a critical role by allowing investors in the primary market to transfer the risks of their investments to other market participants. The financial system comprises of both banks and capital markets. Financial markets perform various functions which, conducted efficiently, help to boost economic growth and living standards. Financial markets bring together borrowers and lenders in ways that best allocate a nation’s financial resources. To do this, they must provide savers with adequate real returns, while satisfying their liquidity and risk preferences; they must also allocate funds to a wide spectrum of borrowers at prices which accurately reflect the riskiness of projects. Financial markets consist of agents, brokers, institutions and intermediaries transacting purchase and sale of securities. The financial market is divided between investors and financial institutions. The term financial institution is a broad phrase referring to organizations which act as agents, brokers, and intermediaries in financial transactions. To these ends, the financial system comprises different types of institutions and markets, each fulfilling specialized roles which reflect its particular comparative advantage. Banks and similar institutions tend to intermediate the bulk of lending to small and medium sized borrowers whose credit worthiness requires a good deal of information to assess. They are the conduits through which the funds of many small savers are transferred to borrowers who cannot raise money directly. That is their comparative advantage, and I expect banks to continue to perform this role for a long time to come. Capital markets, on the other hand, allow borrowers (both public and private), whose credit worthiness is more easily assessable, to obtain funds directly, without the involvement of an intermediary. Borrowing and Lending: Financial markets permit the transfer of funds (purchasing power) from one agent to another for either investment or consumption purposes. Price Determination: Financial markets provide vehicles by which prices are set both for newly issued financial assets and for the existing stock of financial assets. Information Aggregation and Coordination: Financial markets act as collectors and aggregators of information about financial asset values and the flow of funds from lenders to borrowers. Risk Sharing: Financial markets allow a transfer of risk from those who undertake investments to those who provide funds for those investments. Liquidity: Financial markets provide the holders of financial assets with a chance to resell or liquidate these assets. Efficiency: Financial markets reduce transaction costs and information costs. Financial systems with larger overall capital markets provide easier financing for real investment. This relates to both larger securities markets and to more bank credit. Systems that rely primarily on one but not the other may be less efficient. Also the liquidity of the different markets is relevant for this dimension. Many financial innovations reduce capital market imperfections and make markets more complete. This opens up new possibilities to allocate capital across space, time and risk preferences. New financial instruments and practices, for example, allow firms to manage certain risks by shifting them to investors who have a better ability to bear them. Financial systems help produce and spread information about investment opportunities, market conditions and the behavior of agents. The better they function, the lower the asymmetric information between firms and outsiders and the more information should be incorporated into stock and corporate bond prices. There are conflicts between insiders who control a firm and outside investors who provide financing. Better governance ensures that investors receive the full return on their investment and that there will be few deadweight costs due to opportunistic behavior by firm insiders, with beneficial effects on the cost of capital. A key aspect of a financial system is how well it enforces contracts. As it allocates capital across time and space, contracts – either explicit or implicit – are needed to connect providers and users of funds. The legal system and the way in which it is applied by legal institutions determine the “distance” over which capital can be reallocated. Government intervention in financial systems tends to be stronger than in other economic sectors. Well designed regulation and supervision should correct for market imperfections and enhance stability, whereas imperfect policies may have adverse effects on the performance of the financial sector. Greater openness of a financial system and more competition among banks and other financial intermediaries lower capital market imperfections. Pressure from competition, for example, should ensure that financial institutions operate efficiently, earn fewer rents from market power and provide new instruments to customers. Economic freedom means the absence of constraints to economic activities, e.g. corruption, administrative burdens or political interventions that are unrelated to efficiency. Given the great importance of information, contract enforcement and ease of exchange in financial transactions, there is also a significant role for social capital in the form of cooperativeness, ethics and trust. Initial public offer or IPOs refers to the first time sale of a particular stock to the public by a private company in the stock market. Generally the IPOs are issued by newer and smaller companies who want capital for their businesses. The initial public offers are also referred as public offering. For issuing an IPO, the issuer company needs the help of investment banks to underwrite the issue. The investment banks assist the issuer company in deciding the security type, time to bring the offer to market and also on the best offering price of the share. The common principles of IPOs are that they are offered at comparatively lower price than other shares. This is done in order to encourage the investors to buy more shares. Venture capital is basically a form of private equity capital and this is usually offered, by foreign investors and investment professionals to nascent or growing business entities. Venture capital is often issued in the form of cash in substitution of stocks in the company where the investment is going to be made. The venture capital investments bear a higher degree of risk as compared to IPOs, and therefore offer high opportunity for gaining more than average returns. A venture capital fund is a form of a collective investment vehicle and this is frequently seen in case of limited partnership companies. This fund is involved in investing third party investors' financial capital in business entities that are considered to be quite risky in comparison to the banks or standardized capital markets. The majority of venture capital flow from a number or set of investment banks, affluent investors and other types of financial services providers. One of the negative aspects of venture capital for the enterprisers is that the venture capitalists commonly have a voice with regards to the decision making of the company, additional to a part of equity. Stock Dilution may occur from issue of extra common stock by a firm. Dilution may change the fundamental positions of the share, for example, earnings per share, voting right, percentage of ownership and the value of individual stocks. Dilution is any occurrence that diminishes the stock prices of an investor lower than the initial buying price of the stock. Percent dilution is measured at a particular point of time. It can vary as market value varies and is not represented as a measurement of the effect of dilution. Exercising of stock options by the employees, change of preference shares, warrants or convertible bonds into stocks can cause dilution in the value of individual stocks. Raising fresh equity free from the dilution of voting rights can be done by offering warrants to every present shareholder evenly. Secondary public offer is the process of the issue of new shares or stocks for public selling from an organization, which has already done its IPO or Initial Public Offering. Normally, these types of public offerings are done by financial entities that want to raise capital or refinance capital for growth. The funds that have been collected from these types of secondary public offerings are directed towards the company via investment banks, which carry out the underwriting process for the offering. An apportionment or allotment is issued to the investment banks and also there is an overallotment that they can select to practice in case there is a high chance of receiving gain on the spread between the sales prices of the securities and the apportionment or allotment price of the securities. Secondary public offer is a method for an organization to enhance its market capitalization of the stock and spread that is outstanding (the value of the company) on a larger number of shares. When carrying out a secondary public offering of shares an institution has the option to make a rights issue, by this the current stockholders get the special benefit of purchasing a particular number of fresh stocks from the company at a stipulated and lucrative price within a certain period of time. The rights issue is provided to every present stockholder on an individual basis and it can be either entirely accepted (in case of a common rights issue) or can be refused or can be partially accepted by every stockholder. Rights can be non-renounceable (which means the stockholders have two options, either they have to occupy the rights or allow them lapse. When the rights are lapsed, they do not have any existence) or renounceable (which means rights may be sold distinctly from the stocks to other investors within the term period of the right). A private placement is a form of straight private offer of securities to a small number of advanced investors. It is the opposite of IPO. Private placement securities investors include pension funds, insurance companies, stock funds, mezzanine9 funds, as well as trusts. The securities that are issued in the form of private placements are equity, debt, as well as hybrid securities. The private placements are free from public registration according to the Securities Act of 1933. Debt financing is basically borrowing money to keep your business running. Long term debt financing is typically associated with larger assets such as buildings, equipment, land, and large machinery. The schedule for repayment for long term debt financing could be any period more than a year depending on the nature of business. Debt holders of a company do not have any stake in future profits (other than the interest agreed upon) and right of ownership in the company like the equity holders. Debt financing is more commonly known as selling bonds or debentures. Debentures are tools used by large companies to raise capital for their projects and operations. This is known as a debt offering since the company literally goes into debt to the investors until the price of the debenture is paid back, plus interest, or until it is converted to common stock. The company records this as debt in their balance sheet. If bankruptcy occurs, the debenture holders are considered creditors and must be paid back by the company’s remaining assets. Debentures are a way for companies to raise capital without having to use their assets or give up ownership in their company. This leaves their assets free to do other things to generate capital for the business.10 As our study mainly focuses on volatility in stock market Raising of debt capital is not discussed in details. For a market to foster business development it must be attractive to prospective investors looking for investment opportunities. In order for a market to be attractive to potential investors, it must have earned investor confidence, which in turn is achieved through the imposition and effective enforcement of rules which ensure the market is operated efficiently and fairly. The free circulation of capital outside government control has led to the transfer of the concept of power, traditionally invested in Governments, to private holders of capital. This development explains the inability of central banks to curb the speculations which have recently attacked the value of the yen, the dollar and the European currencies. Governments have thus seen their ability to control their budgets and their capital reduced. Their fiscal resources appear to be reduced in relation to private capital and no longer allow them to make the necessary investments. The same applies to the international financial institutions, the World Bank and the International Monetary Fund, which are financed by Governments. In contrast, multinational financiers, managers of private funds and directors of companies or banks tend to become increasingly powerful. Governments urge them to steer their clients’ investments towards their countries: the emergence of private capital as a leading actor on the international scene marks a great turningpoint in the evolution of world financial management. After the Second World War, it was generally believed that Governments were responsible for the allocation of resources. Today, it is the markets which have taken over this role, thus confirming the decline in State-control or New-Deal trends. Moreover, until the early 1980s, Governments endeavored to regulate the international monetary system and capital movements for fear of losing their natural capital and control over domestic economic policy. Attempts at authoritarian regulation have, however, failed, as is evidenced by the collapse of the economies of totalitarian regimes and the difficulties encountered by welfare states since the late 1980s. In different ways, they are the root cause of the disasters experienced by the Soviet Union and the budgetary collapse of the West. Those countries which have attempted to impose severe restrictions on capital movements have generally had to recognize the fluidity of the financial markets, which have moved towards more welcoming political centers, thus creating an offshore industry which still exists. Governments have been compelled to reduce the barriers to capital movements and, in particular, to reduce the amount of tax deducted at source on foreign investments. The liberalization of trade has been accompanied by a liberalization of capital exchanges. According to some financial circles, it would seem that the world capital markets have become “the International Monetary Fund of the 1990s.” From the standpoint of Governments responsible for controlling emerging markets, the question of the taxation of capital flows is extremely important. Such taxes can be useful if they are used to build a market infrastructure. Too high a rate of taxation, however, would drive investors away. The key is to find a proper balance which takes account of the experience of other countries. Brazil, for example, has just imposed a tax of 1 per cent on foreign investments and this has apparently not reduced the flow of capital. Financial institutions that are critical to 13 market functioning should be subject to strong oversight. No financial firm that poses a significant risk to the financial system should be unregulated or weakly regulated. Accountability in financial oversight and supervision must be clear. The financial markets must be strong enough to withstand both system-wide stress and the failure of one or more large institutions. Enhance regulation of securitization markets, including new requirements for market transparency, stronger regulation of credit rating agencies, and a requirement that issuers and originators retain a financial interest in securitized loans. Comprehensive regulation of all over-the-counter derivatives is needed. To rebuild trust in financial markets and among customers, strong and consistent regulation and supervision of consumer financial services and investment markets is needed. We should base this oversight not on speculation or abstract models, but on actual data about how people make financial decisions. To promote transparency, simplicity, fairness, accountability a new Consumer Financial Protection Agency needs to be established. The government should have the tools to manage crises, if and when they arise, so that they are not left with untenable choices between bailouts and financial collapse. Government should resolve nonbank financial institutions whose failure could have serious systemic effects. With globalization and increasing interdependence among the financial markets across countries financial stress can spread easily and quickly across national boundaries. Yet, financial regulation is still set largely in a national context. Without consistent supervision and regulation, financial institutions will tend to move their activities to jurisdictions with looser standards, creating a race to the bottom and intensifying systemic risk for the entire global financial system. To prevent this there is a need to call for tightening the financial regulations across countries. Before nineteenth century, the geographical 14 scope for international finance was very limited compared to what it is today. Italian banks of the Renaissance financed trade and government around the Mediterranean, and, as trade expanded within Europe, financial innovations spread farther north through the letters of credit developed at the Champagne Fairs and the new banks in North Sea ports such as Bruges and Antwerp. Later, London and Amsterdam became the key centers, and their currencies and financial instruments were the principal focus of players in the market. As the industrial revolution gathered force and spread out from Britain, the importance of international financial markets became more apparent in both the public and private spheres. In due course, the scope for such trades extended to other centers that developed the markets and institutions capable of supporting international financial transactions, and whose governments were not hostile to such developments. In the Eastern U.S., a broad range of centers including Boston, Philadelphia, and Baltimore gave way to what became the dominant center of national and international finance, New York. By the late nineteenth century both France and the Germany had developed sophisticated and expanding international markets well-integrated into the networks of global finance. With the world starting to converge on the gold standard as a monetary system, and with technological developments in shipping (for example, steamships replacing sail, the Panama Canal) and communications (the telegraph, transoceanic cables), the construction of the first global marketplace in capital, as well as in goods and labor, took hold in an era of undisputed liberalism and virtual laisser faire15. 9 Mezzanine fund offers a way for publicly and privately held companies to attain financing without going public and potentially ceding ownership of their company. It is a blend of traditional debt financing and equity financing, reaping some benefits of both. 15 The theory or system of government that upholds the autonomous character of the economic order, believing that government should intervene as little as possible in the direction of economic affairs. Do German Capital Markets React When Corporate Insiders Exercise Stock Options?